. . . . . . . . . . . . . . . . . . WELCOME TO SUNSET CENTRAL! . . . . . . . . . . . . . . . . . .
At Sunset Central YOU ARE SO CLOSE YOU CAN FEEL THE OCEAN! As soon as you walk into SUNSET CENTRAL you take a deep breath and start to smile. 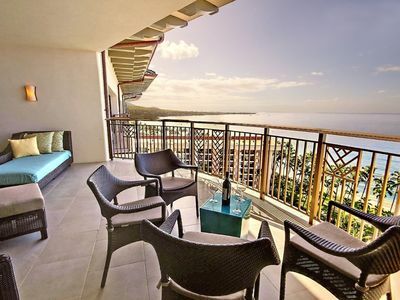 You are seeing the incredible ocean view and hearing the waves. 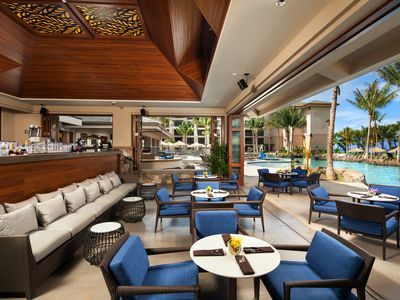 SUNSET CENTRAL IS as nice as you hoped for. Why? The old Cliché, "VIEW, VIEW, VIEW". 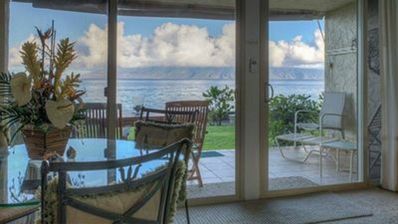 We have of one of the BEST OCEAN VIEWS in Maui. 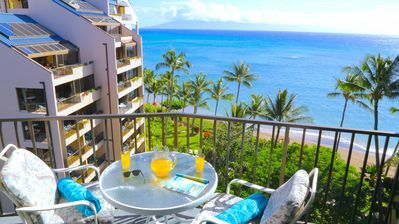 You don't think about it but "NOT" having a pool, or complex lounge chair seating, or tall lanai rails, or anything in your ocean view, makes it that much better. 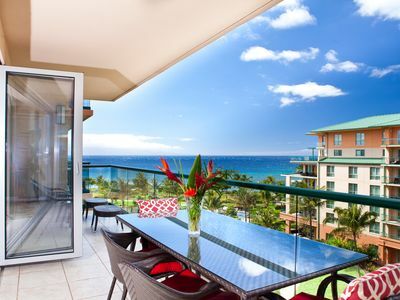 The view from inside the condo is great and the view from our lanai is almost 180 degrees with no obstructions. 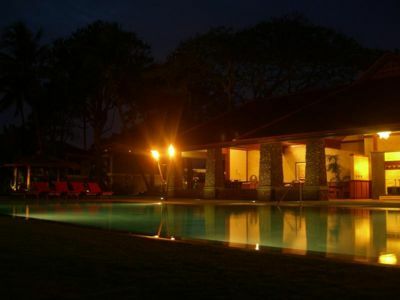 We have the perfect combination for a ROMANTIC stay. 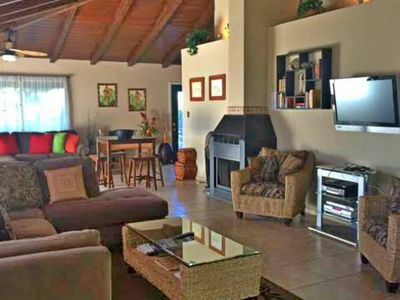 A quiet and quaint location, off the main road, stunning views, and soothing Pacific Ocean surround sound. 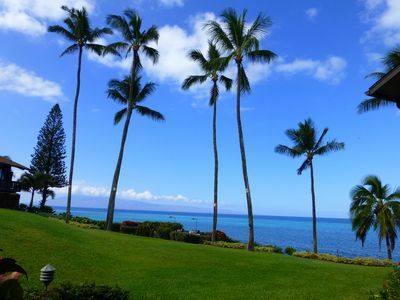 There is NO EQUAL to being GROUND FLOOR directly on the ocean. No walking around your building(s), or down stairs and through hallways, or across streets to get to the ocean. Carry your chair 25 feet to the ocean edge and watch a 180 degree sunset. Does the drink you brought with you need a refill or you forgot your camera? No problem. A few steps back to get it. Don't want to move 25 feet to the ocean edge? 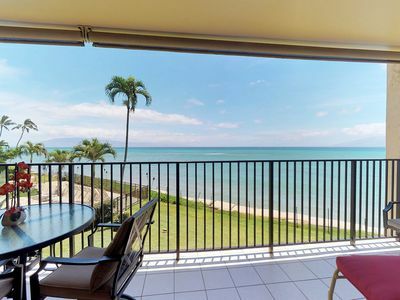 Just watch a sunset, sunrise, or the ocean from your very large lanai. 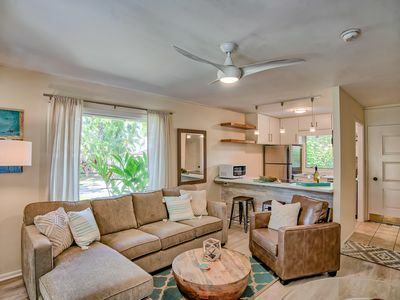 The lanai has a ceiling fan for added comfort. 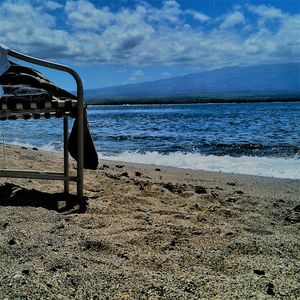 Do you want your condo to be on a beach for sunbathing, snorkeling or just plain walking on it? We have a new upgraded stair access to our little semi-private “Rainbow Beach”. Access to the beach is easy 90% of the time. 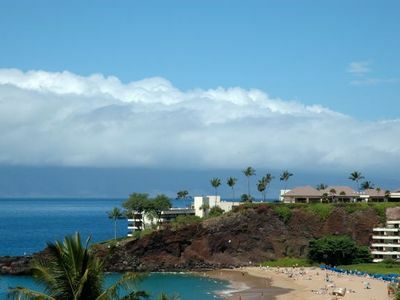 All this while still being just minutes from all of the great things to do on the famous West Maui coast. SUNSET CENTRAL faces directly West providing WONDERFUL SUNSET shows. 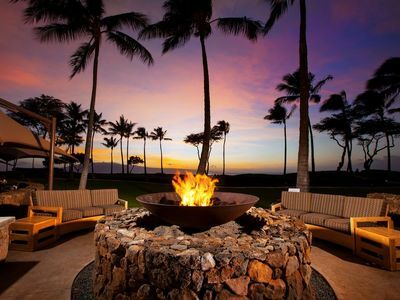 During the year the sunsets move back and forth from the islands of Lanai and Molokai. What a sight. 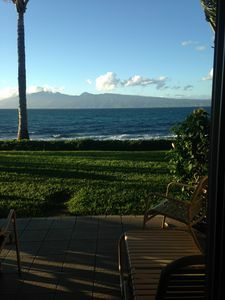 Words can’t describe what it is like watching sunsets from your condo right on the beautiful West Maui OCEAN EDGE and with the sounds of the ocean. It is fun even when the sunsets are not spectacular. The PICTURES, VIDEO, and RENTER COMMENTS tell it all. DECOR: Our goal was to make the family/dining room feel as large as possible even though it is larger than usual for Maui. Our tv/stereo and our dining table set are on one wall. The sofa sleeper and recliner are set up on the other wall. The result is a large open area in the middle of the room. We think we accomplished our goal. We also added mirrors on one wall. 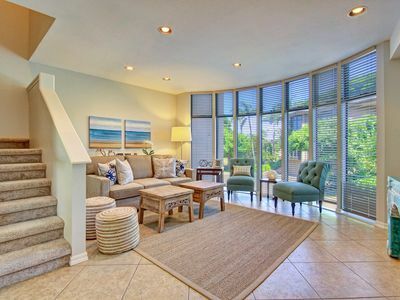 These make the room feel larger as well as providing an ocean view from almost any direction you are facing. SERVICE: We only have one condo to manage so we give 100% of our attention to you and no amount of attention is too much. Even though we can easily accommodate 4 people in our large condo we only allow a max. of 2. 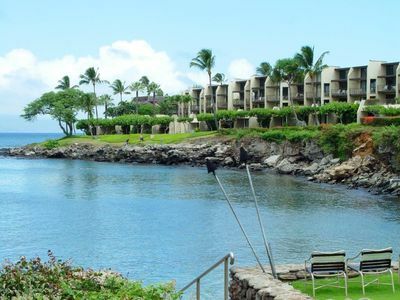 This is to minimize the wear and to help make sure our condo is in good shape when you arrive. We have a large separate bedroom with a CA king size bed. A separate bedroom is nice compared to a studio that has that hotel type feeling. We do have a queen size sofa sleeper in the living room. IMPROVEMENTS: Bathroom remodel in completed changing from tub to walk in shower etc. New Smart TV in Family Room. Netflix available. New TV in the bedroom. Changed phone service that allows calls out to anywhere in the U.S. or Canada. We upgraded the FAN on our LANAI. 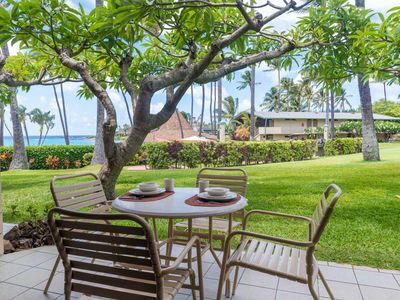 This adds hours per day and night that are comfortable on the lanai. We also vented our washer/dryer unit to outside. Major feature! Less heating inside your condo. When you have a washer and dryer you are not spending part of your vacation watching your clothes in a community facility. POOL: Our pool is not oceanfront. See our photo. 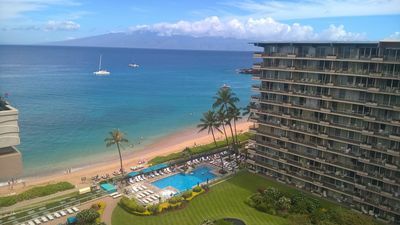 The pool would not be the main reason for renting our condo. A/C: As of 9/15 we have the option A/C in the bedroom. 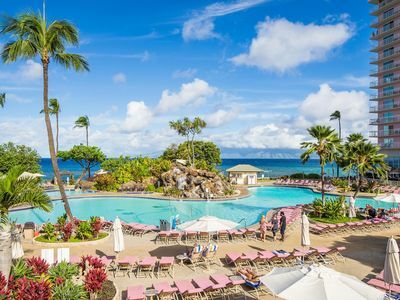 There is an additional $10/nt cost but it is an option. 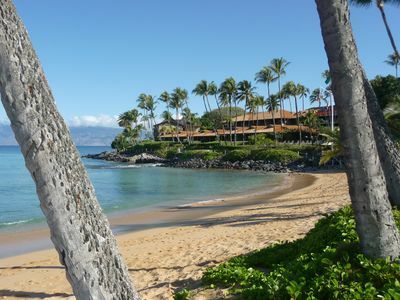 SUNSET CENTRAL is conveniently located between KAANAPALI and KAHANA, just 5 miles North of LAHAINA, and on the renown West Side of Maui. 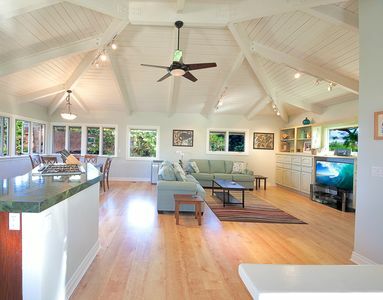 Beautiful modern bungalow super quiet-steps to ocean w/oversized loft & lanai. New Rental! 3 Pools! Ocean View. Private, Gated Community.